Why does Yellowstone want to kill America’s last wild buffalo? There is no justification for it, no matter what the Park Service tells you. Wild bison are not overpopulated, and the so-called brucellosis threat is a livestock industry smokescreen being used to kill wild buffalo and prevent them from being naturally restored on the landscape. Buffalo calf in a sorting pen, inside Yellowstone's Stephens Creek bison trap. Photo by Stephany Seay, Buffalo Field Campaign. There are now approximately seventy-five wild buffalo inside Yellowstone National Park’s Stephens Creek bison trap. 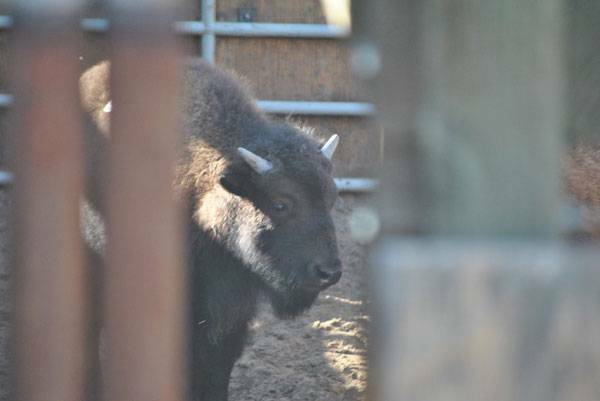 Since capture operations started on February 20, no buffalo have yet been sent to slaughter, but Yellowstone spokespeople tell us that this is likely to occur next week. It is also probable that Yellowstone will conduct one of the two media tours they promised. Buffalo Field Campaign will be in attendance. It is going to be extremely difficult for us to see what these buffalo suffer as they are run through this gauntlet of torture, but it is critical that the public know what Yellowstone is doing — on behalf of livestock interests — to the buffalo whom they are mandated to protect. This particular media tour will allow the public, for the first time in over a decade, to witness a very brief glimpse of buffalo being “processed” inside the trap, something Yellowstone really doesn’t want the public to see. BFC’s media coordinator, Stephany Seay, and the acclaimed journalist Christopher Ketcham, represented by the Animal Legal Defense Fund, have filed a lawsuit against Yellowstone National Park in an attempt to gain full access to the trap for the public and media during the times when bison operations are being conducted. It always bears repeating that the livestock industry’s intolerance is directly responsible for the buffalo’s current brush with extinction. We must put an end to livestock industry control over wild buffalo, and to do so we must repeal or amend the law — MCA 81-2-120 — that places them in charge. As evidenced by his decision to grant year-round habitat on Horse Butte, Governor Steve Bullock is listening, but the livestock industry is trying to undermine his citizen-supported decision. He must hear from each of us, often. Please contact Governor Bullock today ([email protected] ), thank him for granting year-round habitat on Horse Butte, and urge him to help repeal or amend MCA 81-2-120. With endless pressure, endlessly applied, we can end livestock industry control and help regain wild buffalo their rightful, ancestral place on the landscape. Thank you so very much for being with us for wild buffalo!